I was bored on Sunday night before falling asleep and thought…hmm, let me go on Amazon and order pregnancy books. Prior to ordering these three books, I only had one other pregnancy book…the famous What To Expect When Your Expecting. I actually received it after taking an early pregnancy class from the facilitators. I had purchased the electronic copy of the book, but didn’t have the physical copy and honestly I didn’t plan on buying a physical copy. I’ve skimmed through the book, but haven’t read it cover to cover in detail. I love reading on the internet and magazine, but when it comes to physical books, I’m not very disciplined. Well, given that pregnancy is the one topic that I can never learn enough about, I figured I’d commit to reading these. I received them on Wednesday evening, so I haven’t had time to dive into them yet, but plan to this weekend. 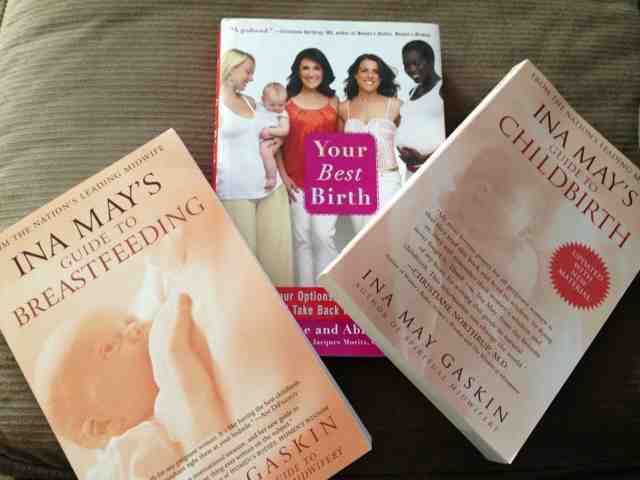 I’m particularly interested in reading the Ina May Gaskin books, because she is a legend in the midwifery industry. She was featured and raved about by Ricki Lake in The Business of Being Born. I also picked up Ricki Lake’s book Your Best Birth, because from watching The Business of Being Born, I’m really interested to see what she’s saying and if its an extension of some sort of The Business of Being Born. I will be posting my thoughts as I read through each one, so stay tuned!